Hampton, Va - The Hampton University community extends congratulations to Dr. Desiree Williams, who was crowned Miss Virginia USA 2016 on Oct. 11 at the Paramount Theater in Charlottesville, VA. Williams is an assistant professor of physical therapy at HU and an HU alumna. 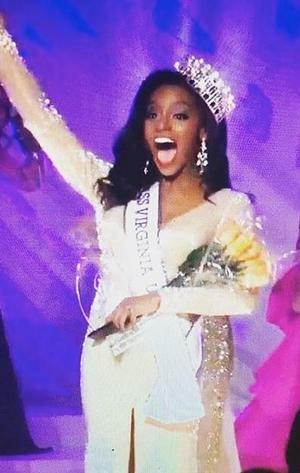 Williams will represent Virginia in the Miss USA pageant in 2016. Williams has won many crowns and served as Miss HU 2010-2011, and in the latter year was featured in Ebony magazine as one of 10 Historically Black College or University (HBCU) Campus Queens. Her other pageantry wins include Miss National Sweetheart, Miss Peninsula and Miss Arlington. Williams was only the fourth African-American to serve as Miss Virginia in the Miss America Pageant system. Williams received her Doctor of Physical Therapy degree from HU and she also earned a Bachelor of Science degree in Health and Physical Education and a minor in leadership studies. She joined the faculty in the Department of Physical Therapy in 2015. As part of her duties, she teaches Test & Measurements Laboratory, Neuromanagement II Laboratory, and Kinesiology Laboratory courses. She also serves as the Faculty Representative for the Fundraising and Outreach Departmental Committee which hosts the University’s Annual Spring “5K by The Bay” event. In addition, Dr. Williams works as a clinical physical therapist for one of the region’s premier health systems.